Dar es Salaam — The African Development Bank (AfDB) has signed three agreement worth $156.39 million (Sh358.236 billion) with the government of Tanzania to support major development projects. Out of the $156.39 million, $123.49 million is a loan for the construction of North-West Grid (Nyakanazi-Kigoma),$13 million loan for the initiative to prevent Aflotoxin contamination and $20 million in form of grant by Global Agriculture and Food Security Programme to support the same course. Speaking today, November 15, during the signing of the agreement, the permanent secretary of the ministry of Finance and Planning, Mr Dotto James, said that the loans from AfDB, have less conditions. "The loans have friendly terms. Their interest is almost zero and the loan repayment period is 40 years," he said. For his part, AfDB country manager, Dr Alex Mubiru, said the Kigoma transmission line intends to improve power supply and lower energy production cost. "This will relieve Tanesco of a financial burden of about $9.44 million spent annually on running Kigoma and Kasulu diesel power plants," he said. 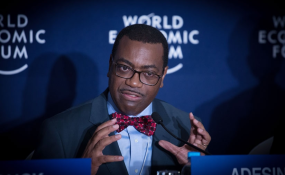 This year, AfDB has signed agreements totaling $213.4 million to support three key projects in the country.